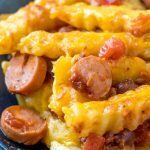 All the classic flavors you crave in a hearty chili dog, with a side of cheese fries, but all bake dup in a single casserole dish for the whole family. Spray a 9 x 13” baking dish with cooking spray and set aside. In a medium sized skillet, saute the sliced hot dogs until nice and fragrant and browned. In a medium bowl, add the hot dogs, chili, tomatoes, and carrots. Stir until evenly combined. Pour this mixture into the prepared baking dish. Evenly arrange French fries in a single layer on top of the hot dog mixture. Bake in the oven at 450 for 30 minutes. Evenly, or as evenly as possible, sprinkle the cheese on top of the fries, and bake an additional 3-5 minutes, or until the cheese is melted.